In physics, the proton (Greek πρῶτον proton = first) is a subatomic particle with an electric charge of one positive fundamental unit. The proton is observed to be stable, although some theories predict that the proton may decay. The proton has a density of about 2.31 × 1017 kg m−3. Protons are spin-1/2 fermions and are composed of three quarks, making them baryons. The two up quarks and one down quark of the proton are also held together by the strong nuclear force, mediated by gluons. Protons may be transmuted into neutrons by inverse beta decay (that is, by capturing an electron); since neutrons are heavier than protons, this process does not occur spontaneously but only when energy is supplied. The proton's antimatter equivalent is the antiproton, which has the same magnitude charge as the proton but the opposite sign. Protons and neutrons are both nucleons, which may be bound by the nuclear force into atomic nuclei. The most common isotope of the hydrogen atom is a single proton. The nuclei of other atoms are composed of various numbers of protons and neutrons. The number of protons in the nucleus determines the chemical properties of the atom and which chemical element it is. In chemistry and biochemistry, the proton is thought of as the hydrogen ion, denoted H+. In this context, a proton donor is an acid and a proton acceptor a base (see acid-base reaction theories). The proton is the simplest composite particle. It contains three fermions, called quarks, that have shed all their color charge into a halo of gluons as dictated by the quantum probability wavefunction of the color interaction. A gluon is similar to a photon of light, except that a gluon goes both backwards and forwards in time, it has a quantum 'color' charge at one end, and a quantum 'anticolor' at the other end. In the middle, the gluon is colorless. The gluon halo places all the color and anticolor at the surface of the proton, while the center of the proton is colorless. This colorless center is where the now-essentially colorless quarks spend most of the time. The quarks are 'confined' to this colorless center but have plenty of space to move around in as size of the quarks compared to the extended gluon halo is as three dust particles are to New York City. 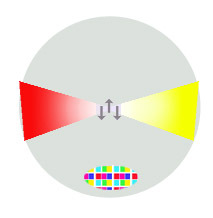 The surface of the proton, as far as the color interaction is concerned, can be compared to a color computer screen displaying white. On close inspection, however, it is composed of red, blue and green pixels. This is why the color surface of the proton with its pixels of gluon ends appears colorless. The energy of this relatively vast gluon halo is responsible for 99.9 percent of the mass-energy of the proton. The quarks, while shedding their color charge, have no way to shed their electric charge. As the charged quarks are confined to the colorless central regions of the proton, the electric diameter of the proton—the region where all the electric charge is concentrated—is significantly smaller than the color-charge diameter of the proton. There are two types of quarks in regular matter. The three quarks in a proton are two U-quarks each with +2/3 electric charge, and a D-quark with -1/3 charge. The composite proton has an overall charge of +1. In a neutron, the other composite particle found in atomic nuclei, there is one U and 2 Ds, and the neutron has zero overall charge. An aspect of the color interaction akin to polarization in light photons makes the neutron combination of quarks generates a few more gluons than the proton combination, and this gives the neutron slightly more mass-energy than the proton. This is a diagram of a proton (not to scale, of course), with one of the gluons magnified. This particular gluon—one of the eight possible combinations of color-anticolor, has quantum red going forward in time and quantum blue (as its anticolor complement, yellow) going backwards in time. As long as the (sand-grain sized) quarks stay in the colorless center, the experience what is called 'asymptotic freedom' and are free of the color influence on them. In this state, they align themselves according to the quantum waveform of their electromagnetic interaction as they freely couple photons. For the quark to leave the colorless center and pick up color from the periphery, however, takes a lot of energy. So much energy, in fact, that [virtual particle]-pairs of quarks and antiquarks become real when a quark gets kicked out of the center (perhaps by a very energetic electron) and new combinations of quarks swathed in gluons appear, such as [pions] and other such combinations. At no time in any such process is there a "bare quark" which can be observed. Quarks are confined by what is called “infrared slavery” (they cannot escape their low energy colorless state) to always be observed in composite, colorless combinations. Prior to Rutherford, Eugene Goldstein had observed canal rays, which were composed of positively charged ions. After the discovery of the electron by J. J. Thomson, Goldstein suggested that since the atom is electrically neutral there must be a positively-charged particle in the atom and tried to discover it. He used the "canal rays" observed to be moving against the electron flow in cathode ray tubes. After the electron had been removed from the particles inside the cathode ray tube they became positively charged and moved towards the cathode. Most of the charged particles passed through the cathode, it being perforated, and produced a glow on the glass. At this point, Goldstein believed that he had discovered the proton. He calculated the ratio of charge to mass of this new particle (which in case of the electron was found to be the same for every gas that was used in the cathode ray tube) was found to be different when the gases used were changed. The reason was simple. What Goldstein assumed to be a proton was actually an ion. He gave up his work there. The antiproton is the antiparticle of the proton. It was discovered in 1955 by Emilio Segre and Owen Chamberlain, for which they were awarded the 1959 Nobel Prize in Physics. Due to their stability and large mass (compared to electrons), protons are well suited to use in particle colliders such as the Large Hadron Collider at CERN and the Tevatron at Fermilab. Protons also make up a large majority of the cosmic rays, which impinge on the Earth's atmosphere. Such high-energy proton collisions are more complicated to study than electron collisions, due to the composite nature of the proton. Understanding the details of proton structure requires quantum chromodynamics. ↑ CODATA values for proton mass and proton mass energy equivalent, NIST Reference on Constants, Units and Uncertainty. Retrieved September 19, 2007. ↑ B. Povh, Klaus Rith, Christoph Scholz, and Frank Zetsche, Particles and Nuclei: An Introduction to the Physical Concepts, trans. Martin Lavelle (Berlin and New York: Springer-Verlag, 1999, ISBN 3540438238). This page was last modified on 11 June 2015, at 19:51.